Students accepted to the Class 2021 visited campus for an admitted students program Friday. The University accepted more students this year than ever before. Updated: April 11, 2017 at 9:47 p.m. Even as officials admit more students to GW than ever before, experts say fewer are expected to end up at the University in the fall. GW accepted 11,031 students this year – nearly 1,000 more than last year and the most in at least 13 years. Experts said that because high school seniors are applying to more universities, officials were likely forced to accept more students to make sure enough freshmen enroll – and because so much of the University’s revenue comes from tuition, they must make sure there are the right number of students on campus to make enough money. GW received a record high of more than 27,000 applications this year, significantly more than last year’s 25,541 accepted students. Applications soared by 28 percent for the Class of 2020 last year after the University switched to a test-optional admissions policy. GW’s admit rate crept up to about 40.9 percent this year, compared to 40.2 percent a year ago, but is still lower than the record high 45 percent in 2015. 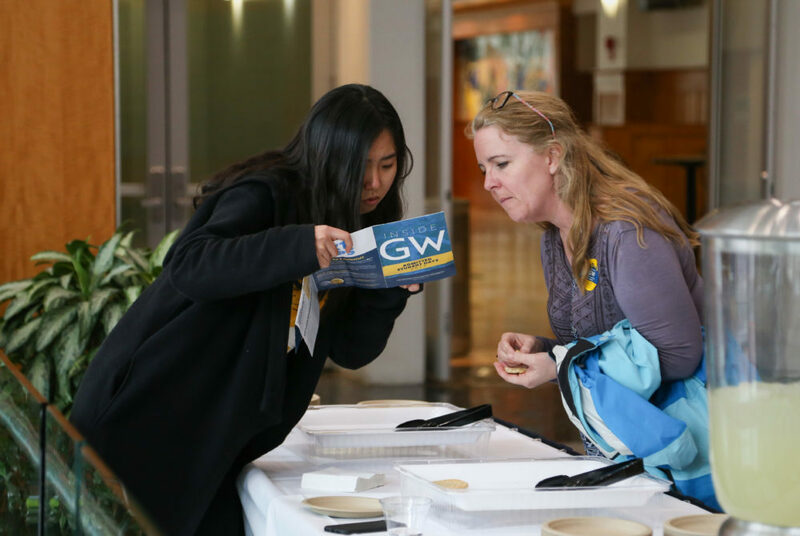 Laurie Koehler, the vice provost for enrollment management and retention, said in an email that in recent years, more “academically talented” applicants have applied and been accepted to more universities, leading GW’s acceptance numbers to reach historic highs. Koehler said that because students have so many institutions to choose from, they impact the University’s yield rate – the number of students who enroll. GW’s yield rate for the Class of 2020 was 24.7 percent, compared to 25.5 percent for the Class of 2019, according to institutional data. 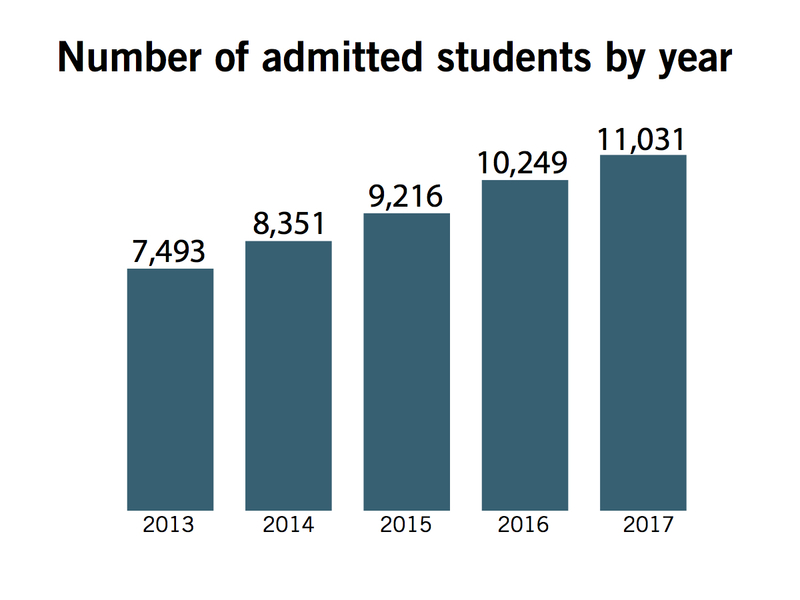 The number of admitted students who enroll at GW has been steadily declining since 2012. “Our goal is to enroll the best students possible, not push for a lower admit rate by accepting students with a weaker academic record who will have fewer college options, and likely yield at a higher rate,” Koehler said. In 2015, national yield rates averaged about 32.9 percent, according to U.S. News & World Report. American University projected a yield rate of 36 percent for the Class of 2020, while Georgetown anticipated a rate of 47 percent. Koehler said GW plans to enroll between 2,500 and 2,600 freshmen for the Class of 2021, about the same number as it has since 2001. Richard Vedder, a professor of economics at Ohio University, said lower application fees and the Common Application – the program that allows students to apply to multiple universities through the same general application form – have contributed to declining yield rates for institutions nationwide. GW began using the Common App exclusively in 2013. Prospective students are now often sending one application to more than 10 schools, leading to a larger gap between admitted and enrolled students at most universities, he said. Vedder added that in-person interviews and on-campus events can help officials note which applicants are most serious and enthusiastic about attending the university, helping them better predict their yield rates by preferring those applicants. GW’s admit rate is higher than surrounding D.C. universities, which he said that could hurt the University’s reputation if the admit rate is sustained for an extended period. This year, two of GW’s peer institutions, Georgetown and Northwestern universities, accepted 15.4 and 9 percent of applicants, respectively. The Hatchet incorrectly reported that last year’s admit rate was 39.5 percent. It was 40.2 percent. We regret this error. This article appeared in the April 10, 2017 issue of the Hatchet.